CIC is the developer of Carmelray Industrial Park I (CIP1), a 230-hectare industrial estate in Canlubang, Calamba, Laguna, Philippines catering to light and medium industries. CIP1 is a component of a 500-hectare Township development called Carmeltown, being planned and implemented under Mr. Abores’ leadership. The development includes affordable, mid-income and high-end residential enclaves, a commercial center, educational institutions, ports and country club, health and wellness facilities, lakes, gardens and parks, etc. 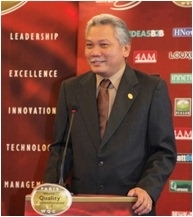 Prior to his joining Carmelray Group, Mr. Abores was the founding president of Schema Konsult, Inc. (Schema). He held this position from July 1987 to March 2000. Schema is a multi-disciplinary planning and engineering consulting firm and one of the Philippines’ largest and most respected. The firm grew from 12 professionals in 1987 to about 500 personnel in various fields of architectural and engineering disciplines. Schema provided planning, design and project management services to private and government corporations and institutions in the fields of urban planning and design; water supply and wastewater treatment facilities, dams and irrigation systems; roads and bridges; mass transit system; airports; industrial, commercial and residential estates; low, medium and high rise buildings; etc. Schema also provided consultancy services to infrastructure projects funded by various institutions such as ADB, World Bank, USAID, DANIDA, OECF, and others.